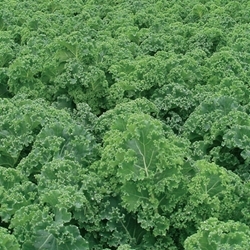 Kale has been cultivated over 2000 years and probably originated from the Mediterranean region of the world. Despite its hot origin, kale grows better in colder climates and is very popular in Northern and Eastern Europe, especially Scotland. Kale is a part of the cabbage family, Brassica Oleracea. Kale is off the charts rated for vitamins A, C and K. All plants are certified organic. Sold as a four pack. Select here for transplant information, pick up and order dates. Unique blue-green savoyed leaves on extremely vigourous plants. Ideal for raw kale salads and soups. Leaves are very dark blue-green and heavily savoyed, sweetening with each frost. Also known as Dinosaur or Tuscan kale. Exceptionally attractive plants with tall, upright architecture and narrow, tightly curled leaves that are sweet, tender and easy to de-rib.